Meri (my) behno (sisters)!!! Breakfree!! Loosen up! Gear up! RAISE YOUR VOICE! Time for some crazy chit chat. May be Some serious stuff as well. 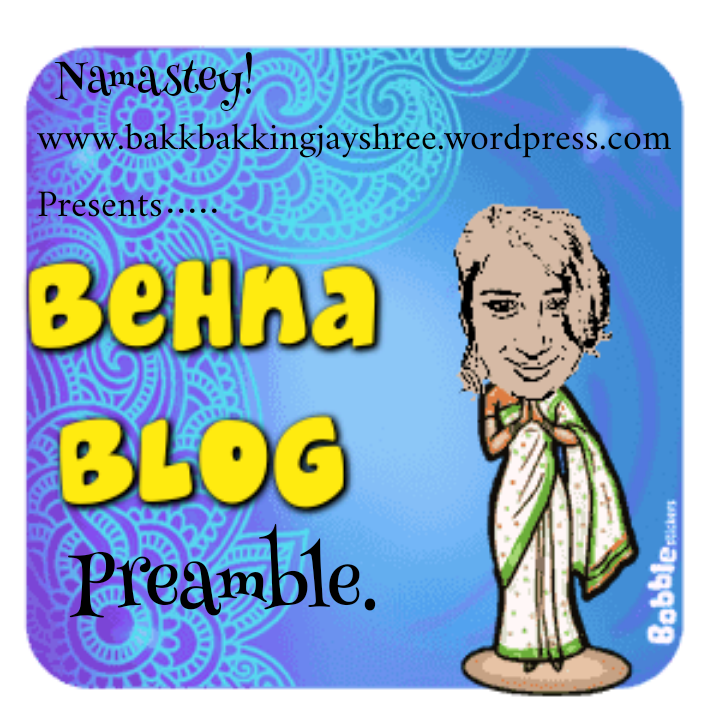 The whole idea behind Behna blog (BB) is that why don’t we question? Especially women ( men will never question, so they are not in the picture! Poor guys look better answering them, hehe) . Questioning to me is like my birthright, because until and unless I don’t question how would I get clarity. Also how would I’ll be sure that what I know is correct. Wake up sistas! question ! Get your thinking caps on! That it has no rules. Just damn all! Say what you like. Talk as if no one’s listening. Women are powerful, in ways different than men. And thus to bridge the difference, They should read.Accept and respect power in all forms, Men should learn that. Connecting women across the world, irrespective of backgrounds or degrees or knowledge. exchange of new unconventional ideas, perspective, dimensions, experiences,thoughts. Arguments, debates. To Gaining clarity and reasoning. To better our understanding, to live in the highest standards of our being. Learning about new cultures ( interests me alot). Discussing different facets of woman. To the spirit of womanhood across the globe. Posted in Behna Blog. Tagged Being, Blogging, Bond, Breakfree, Chit chat, Connecting, Culture, Discover, Diverse, Explore, Feminine, Free, Gear up, Globe, High, Matter, Me, Men, No rules, Power, Proud, Question, Sisters, Spirit, Standard, Voice, Womanhood, Worldwide. Next: Next post: BB Post #01- On Emotions. Jai behen power…as being a man i will say thay behen(sister) are superpower for brothers too because she is the only one who saves from parents hehe (kiddind).. But yeah actually they understands everything without saying just by facial expressions, sister is that gift from god and parents to a brother is combination of god and parent in one…. High Five👋 welcome to BB..
Well written jay. Most of us behnas keep so much within us. We need to let go.